Cataract. Acrysof ReSTOR artificial lens. crystalline lens elastic shape change (the accommodation principle). In healthy eye light is passing through the cornea and the natural crystalline lens, and getting refracted is focused on the retina. Injuries, deceases, absence of the crystalline lens or age-related changes of the latter disturb normal focusing and lead to vision disorder. One of such disorders is presbyopia (age-related hyperopia). The crystalline lens is losing it’s elasticity with age and cannot adapt to the focal distance change. This creates difficulties for reading and is forcing one to use spectacles. 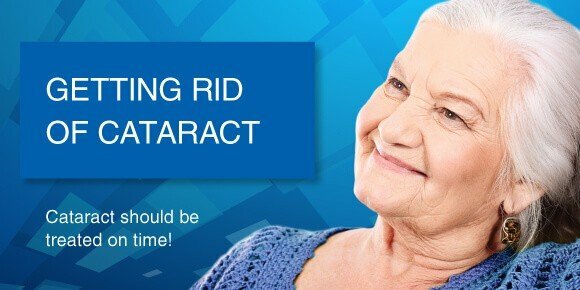 Very often another common problem is developed – cataract which is opacity of the natural crystalline lens. In case of cataract the crystalline lens located behind the pupil is losing it’s transparency. This results in less light penetrating the eye, unlike unobstructed situation in a healthy eye. One of the causes of cataract is the change in the bio-chemical composition of the lens due to are-related effects inn the body influencing blood and nutrients supply. The most effective and secure treatment is a surgery. It replaces the crystalline lens damaged by cataract with an artificial intraocular lens. There are many different artificial lenses on the market but there is one which is much superior to the rest of the traditional models: the multifocal (pseudo-accommodating) AcrySof ReSTOR lens. This multifocal lens allows to manage two problems altogether: cataract and presbyopia. According to clinical trials data 85% of patients who has had the AcrySof ReSTOR lens implanted never use spectacles. The most advanced technology and optical approach has been used for the development of this lens: diffraction, pseudo-accommodation and apodization. Unlike traditional lenses used in ophthalmology the optic structure of AcrySof ReSTOR is multi-level and multy-stage. When regular intra-ocular lens is implanted the patient usually needs glasses for the foreground. AcrySof ReSTOR provides good vision far and near. The levels make the light disperse into smaller waves and shape image in several focusing points. The vision quality is for you to test. The use of diffraction principle ensures vision restoration for far and near without spectacles or contact lenses. So AcrySof ReSTOR creates the vision pattern very close to the natural. To improve contrast and clear vision the AcrySof ReSTOR lens is using the apodization principle based on sequential decrease of step heights of the optic from 1,3 μm in the centre to 0,2 μm on the outside. You can see the enlarged image of the AcrySof ReSTOR lens optic on the left. Apodization is used widely in microscope and telescope manufacturing to increase light signals and improve image quality. The picture shows how apodization reduces halo around the image. Thanks to apodization the patient’s vision quality is less dependent on the light amount entering the eye and the pupil size. AcrySof ReSTOR will ensure comfortable vision any time of the day. Besides the material the AcrySif ReSTOR lens is made of is water-repellent acryl which is the best for intraocular lenses. It has unique biocompatibility features and ensures fastest vision restoration and secondary cataract development prevention. Bio-mechanical features of AcrySof ReSTOR allow to implant the lens through an incision of 2,75 to 3,2 mm and perform the surgery outpatiently. Since 1993 over 23 million AcrySof lenses have been implanted. It is considered by ophthalmologists to be most preferred, safe and time-proven.